The land of Athral Isle is temperate for the most part. It is a land of variety in terrain and quality. It has low salt marshes in the south, white beaches and the busy port city of Malden in the southwest, and the capital of Exendun in the southeast. A line of mountains runs from near Malden in the southwest up along the western coast. Along the western coast of Athral Isle, it is not uncommon to find sheer cliffs from the sea to the mountains. There are a series of small, rocky islands found off the coast thch have been the home of many legends over the centuries, not the least of which is the Firstborn city found on the small island of Maithrindar. Now a place of moss-covered ruins, it was once thought to be a powerful citadel of the Firstborn. Only a few fisherman live there, and they do not stray far into the ruins. Further inland, lowland farms reach from the mountains of the west toward the eastern coast. They stop only for the Geistwood. The Geistwood is a vast forest covering the midlands, the north and the east. While there are villages in the heart of the forest and one large city, Seresbury, the wood has long been thought to be infested with spirits and monsters. It is home to many bandits, and the most noted of these are the Firstborn Sons. Uethil was once a Firstborn city, but fell into ruin. Now it is a site of a thriving village. Given its location and legends about the wood, the Gauntish presence there is minimal; many uprisings start there. Off the eastern shore, there are tiny rocky islands and hidden hazards to navigation. The one large eastern seaport is Seastone Deeps. It is one of the few places along the coast with a relatively clear and safe approach. Lighthouses along the coast guide travelers past hazards and toward Seastone Deeps. The city itself is a fortress; when Gaunt invaded it was the first place attacked and among the last to fall. 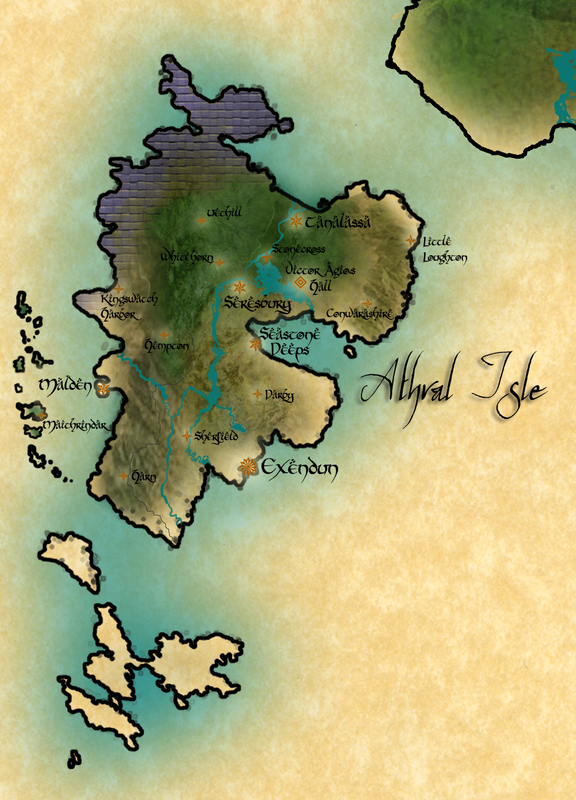 North and eastward, there are more mountains, including the highest mountain in Athral Isle, Kier's Rock. The people of the highland mountains are a hardy people dwelling in small settlements. The one exception is the city of Tanalassa, nestled in the mountains near the Thistlewine River. Tanalassa is a trading city, and many rivercraft carry goods up and down the river between Tanalassa and Seresbury. In the north and the west of Athral Isle, the land is barren. Few trees grow, and the plants that grow out of the earth turn to ashes. No one knows for certain how long the land has been poisoned, and there are many stories of how the Wasteland came to be. Bandits dwell just inside the wastes, raiding across the border for food and drinkable water. People even more wicked make their homes in the Wasteland as well. The actual political boundaries are made up of 9 counties. These counties are Malden, Seastone, Conwarashire, Seresbury, Tanalassa, Harn, Darby, Hempton, and Sherfield.